Yesterday evening, Cosme Decorte hosted an intimate workshop by makeup artist Clarence Lee at Mandarin Hotel for their AQ makeup line which was recently launched in Singapore. I was glad to see yet another Japanese prestige makeup brand making its foray into Singapore. 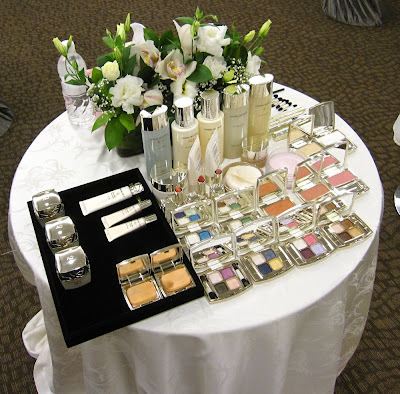 Cosme Decorte is Kose's most prestigious makeup and skincare brand. In Japan, there are several sub-brands under the Cosme Decorte brand such as Magie Deco. 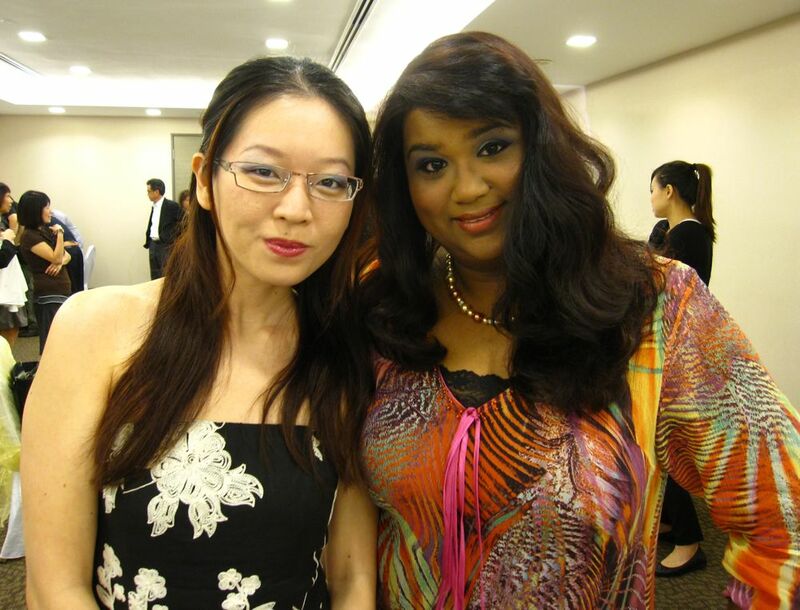 The workshop was hosted by MediaCorp 93.3 DJ Chua Wei Ping, who had earlier also hosted the Niu Er Talk Show. I attended together with Sophia (The Make-up Blogette), Kas (Shine, Shimmer & Sparkle) and Mag (Makeup Stash). Check out the colorful array of Shadow Supreme palettes! The distinguishing feature of the AQ makeup line is that all the products contain a "gold colloid powder" which gives the makeup a deep and delicate sparkle. The gold is dissolved into a liquid called "Aqua Regia" which is an ultra fine particle at the nano-level below a five thousandth of a millimetre of gold. It is then dispersed into water and sprayed onto a pearly sheen agent, resulting in a gold with a purple tint. 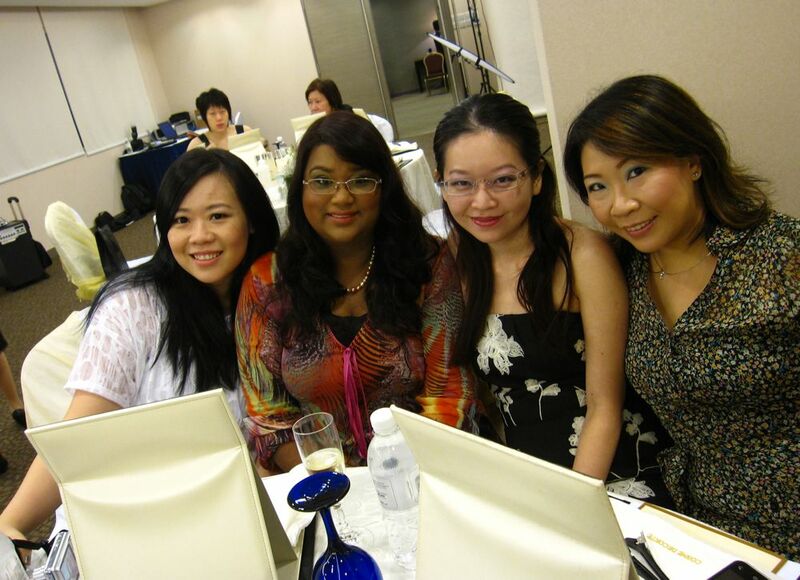 The products also contain moisturising agents for skincare benefits. The model with her skin prepped only with skincare. 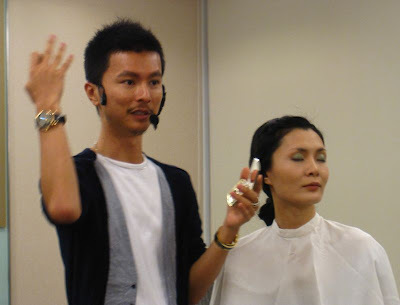 Clarence started by applying a light layer of the Makeup Base 01, followed by the Cream Foundation Supreme. As the model had good skin, she needed only a light layer of the foundation to even out her skintone. Instead of dotting the foundation all over the face and then blending, Clarence's preferred way of applying it was put some of the foundation in his left palm, and then use his fingertip to dab and blend, section by section. One tip he gave was to always apply primer and foundation in a downward motion, which gives a more natural finish and helps to prevent the clogging of pores. When I tried out the Cream Foundation on my skin, I was impressed by its light texture and natural finish. It was also very easy to blend and did not cause my skin to turn greasy fast. Next, he used the Modelling Nuancer 900 Shade Brown to shade under the cheekbones towards the jawline. He applied the Nuancer with a sponge and then blended it out with his fingertips. This helps to make the face look slimmer. He also applied a touch of the Nuancer 900 just under the inner corners of the brows. Next, he applied the Modelling Nuancer 001 White on top of the cheekbones, down the bridge of the nose, just above the brows and on the chin. The Nuancer is good for correcting the dark areas at the outer corners of the under eye area and lips, which tend to drag down the face. Swatches of the Modelling Nuancers. 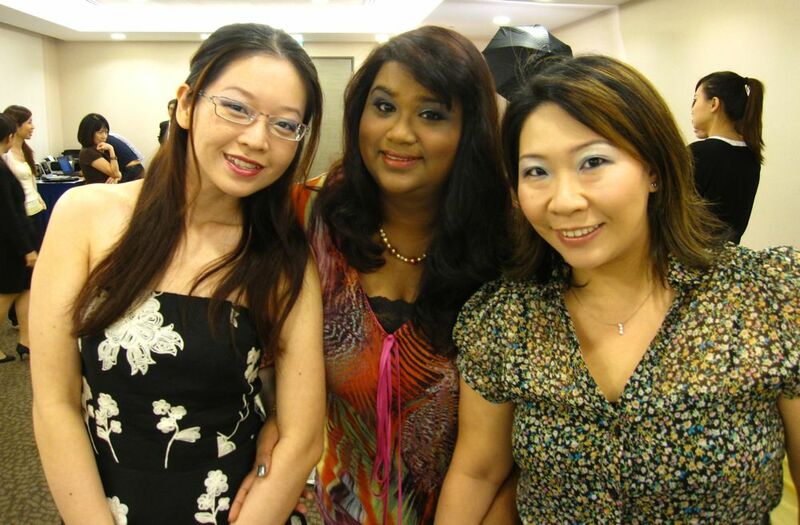 The base makeup was completed by lightly patting on the Face Powder N 001. 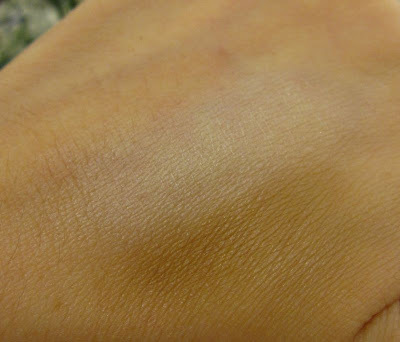 The pale pinkish lilac shade helps to gently illuminate the skin. 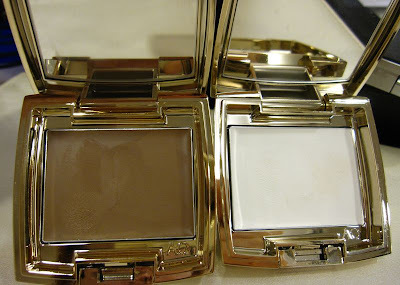 The texture of the powder is incredibly silky and divine. On the eyes, Clarence did a simple smoky look by first using his finger to apply the green shade from Shadow Supreme 027 in the middle of the lid. Next, he used the sponge tip applicator to apply the dark moss green shade from Shadow Supreme 022 at the outer corners and inner corners. To make the eyes look bigger, he advised that it was important to ensure that the shadow/liner along the lower lashline should join up with that on the upper lashline at the outer corners. He applied the brush in a very light downward motion. He used warm peach blush on the apples of the cheeks with a pink blush blended on top of the apples of the cheeks. Afterwards, we got to try creating the smoky eyes on ourselves. Most of us ended up using the Shadow Supreme 026 (a blue quad), but mixed it up with shades from some of the other palettes. Thanks to Debbie for the invitation! You can read Sophia's post about the workshop here! 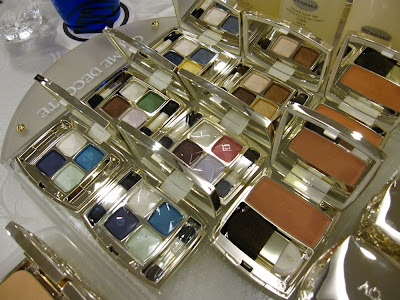 Hi, the eye shadow quads colour combination looks good. I like the green & blue quads. Where can I find this new launch? Takashimaya? Thanks in advance for responding to my query. 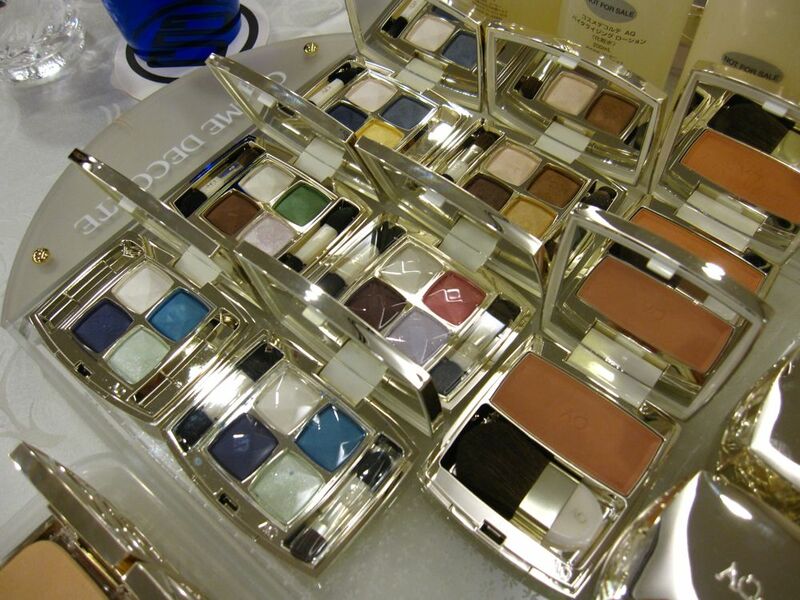 Do you have any swatches of the eye shadows? So so lovely. 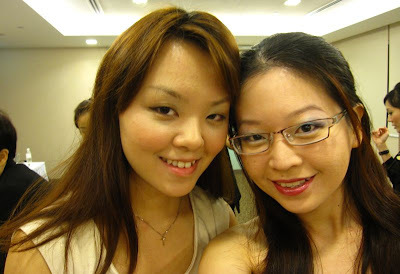 Especially want to try out the base in 01 and the contouring cream. Nope, I didn't do any swatches as the lighting in the room was not suitable for taking accurate photos. 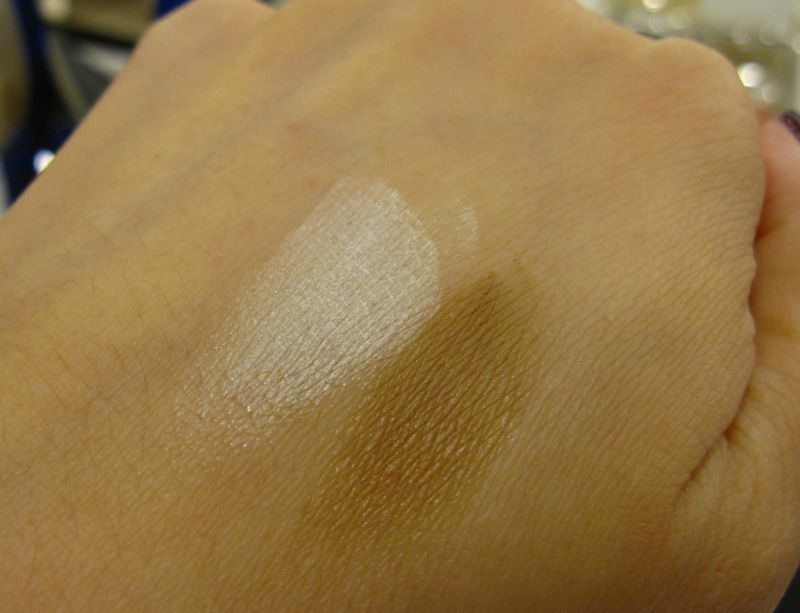 Hello, Can you tell me what shade you are in the Cosme Decorte AQ cream foundation? Also, what type of finish does the foundation give you? Is it worth it to get if I have combination oily skin? Is it better to get the base also? Sorry so many questions. Thanks for your help!